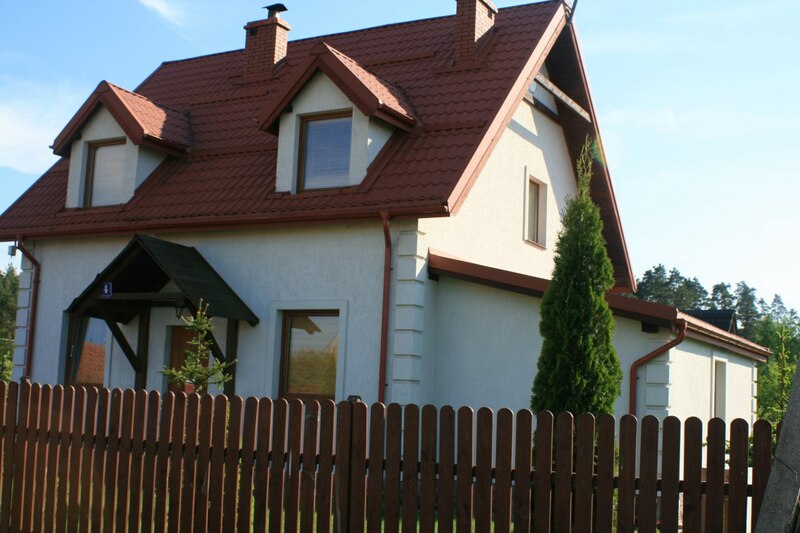 Mazurski Dom is a comfortable year-round house in the heart of Masuria, in the village of Rydzewo on the Niegocin Lake - Trail of the Great Masurian Lakes. The attractive location of the house guarantees a rest in the commuter conditions in the "Green Lungs of Poland" within 100 meters there is a forest with old trees and clear lake waters Niegocin with a private beach. A detached house with a garden, a terrace, a fenced parking place. On the ground floor there is a living room, a kitchenette, a bathroom and a bedroom. On the first floor there are two bedrooms with a bathroom. In the bedroom on the ground floor there is a double bed with a wardrobe. In the living room on the ground floor there is a leather sofa, TV, table. The kitchenette is fully equipped with a kitchen with ceramic hob and oven, large fridge with freezer, dishwasher and tableware and table with chairs. In the bedrooms there are double beds and double sofa beds, wardrobe and chest of drawers. Additionally, the terrace is garden furniture and barbecue. For our guests who want to taste the regional cuisine we have to offer delicious meals and a bar with refreshing drinks and aromatic coffee in our Bistro on the Lake.